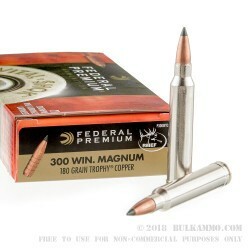 An ultra-premium 300 win mag load with a focus on copper for a variety of reasons. 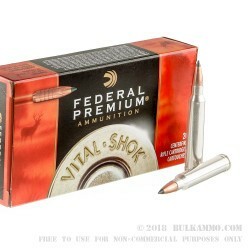 The Federal Premium Vital Shok all Copper polymer tipped “Trophy Copper” load is a special .300 Win Mag that offers a large grain weight for an all copper projectile along with the other perks of being in all copper, including that which satisfies some state regulations for hunting. Despite a hefty price tag, there is a lot to like about this loadout. 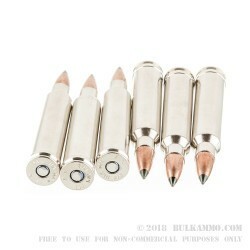 The 180 grain projectile is an all copper bullet with a polymer tip that ensures maximum deformation in the form of a peeling, mushroom shape. 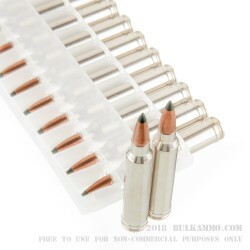 The devastating ballistic numbers including a much improved ballistic coefficient makes this round capable of humane kills beyond 400 yards if needed and on game as large as Elk/Moose/Caribou and other big game including deer and antelope. The significant 2960 feet per second velocity and 3500 ft. Lbs. of energy at the muzzle and the 90%+ weight retention of the bullet means your game is generally dropping where they stand. Premium components including powder that burns thoroughly and doesn’t create a ton of excess residue and primers (Boxer) that ignite with top tier reliability as well as a nickel plated brass casing ensures that the load, through and through, is a premium load.